These spots have no Wi-Fi, no electricity, and nothing between you and your greatest nature fantasies. Bring a book, not your laptop. In this often hectic world, sometimes you need to unplug in order to recharge. You know — switch that fast-paced city life for a healthy dose of Mother Nature and a few deep breaths of fresh, country air. 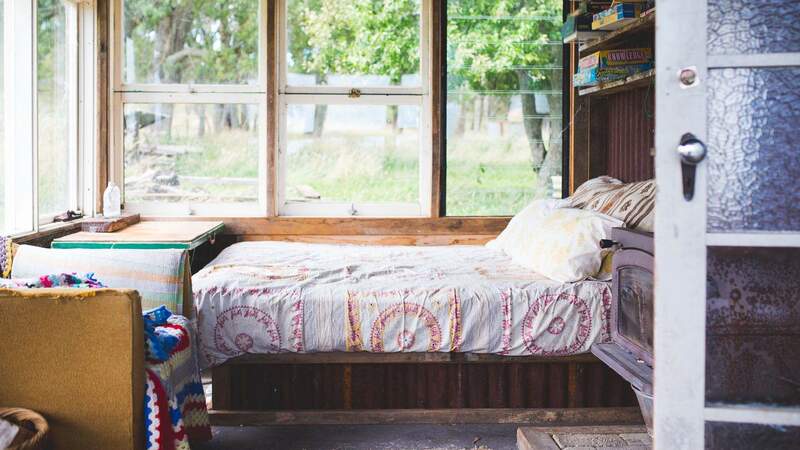 Luckily, you don't have to venture too far from the big smoke for a taste of off-the-grid living, with secluded eco-friendly cabins and delightfully makeshift rooms to be found all across the state. 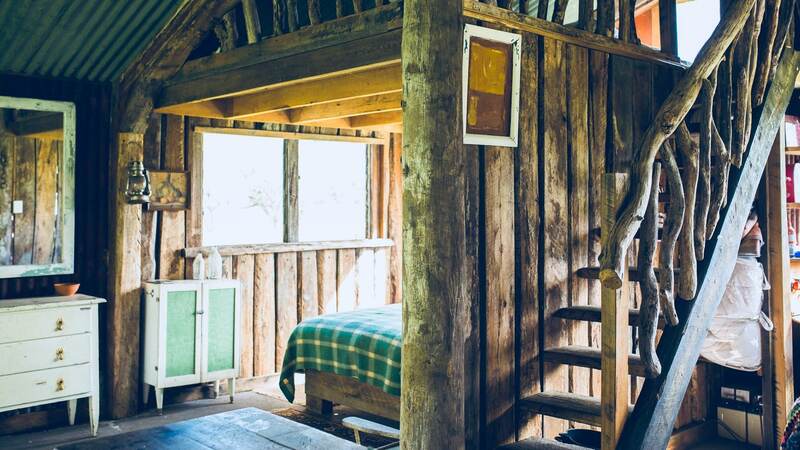 Switch off, disconnect and enjoy a much needed slice of serenity at one of these five NSW off-grid stays. 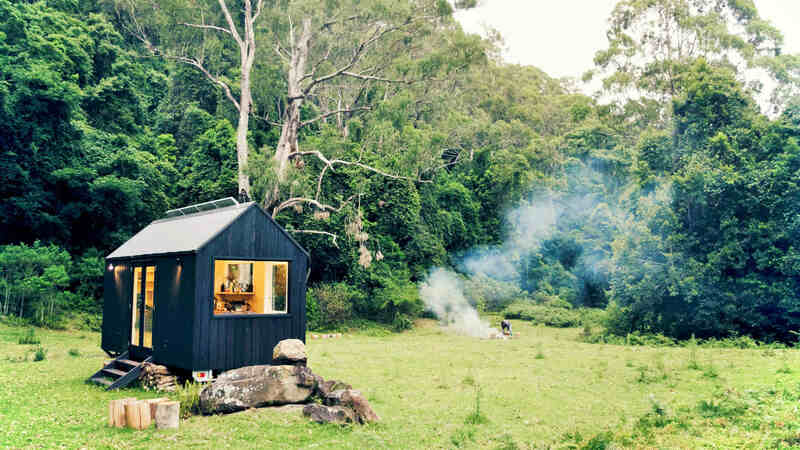 Aussie company Unyoked delivers an off-the-grid experience that'll see you disappearing to your own private tiny house in the wilderness, miles from any sign of human interference. The company has four solar-powered sustainable tiny houses in NSW, each set in a secret patch of wilderness on a private property an easy drive from Sydney. Eco-friendly features like composting toilets and zero wi-fi invite you to disconnect from your regular life, though fixtures like cosy beds, hot showers and gas stoves will keep you super comfortable while you do so. If you're a sucker for a bit of rustic charm, then WeilHouse Living's eco-friendly wilderness hut could be the off-grid experience of your dreams. Keep that carbon footprint to a minimum while you get a taste of proper country living, surrounded by magical Aussie bush and farmland. The cheery home-spun space has been crafted from mainly recycled timber, runs on solar power and has been fitted out with a slow-combustion stove and gas cooktop, an outdoor bathroom with shower and toilet, and an old-fashioned ice box instead of a fridge. Spend your days hiking the surrounding national parks and your evenings kicking back playing board games by the fire. Have you ever dreamed of spending the night in a giant transparent bubble, with the twinkling stars in full view above you? 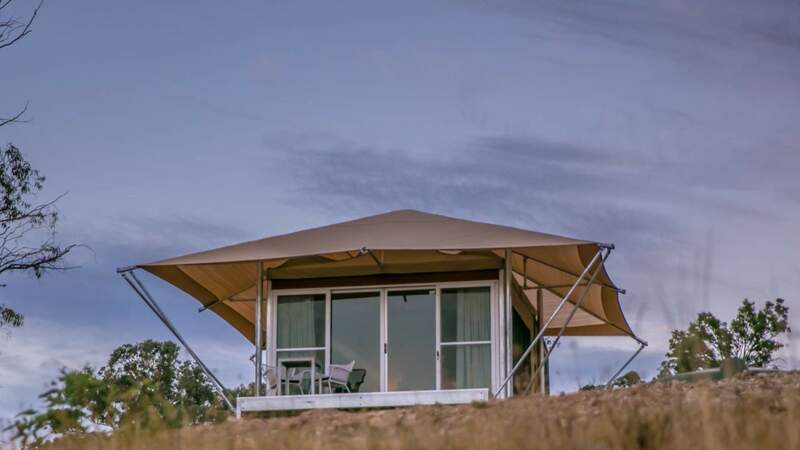 Well, now you can, thanks to Bubbletent's Aussie-first inflatable glamping tent, which sits in a remote pocket of a working farm, between Mudgee and Lithgow. 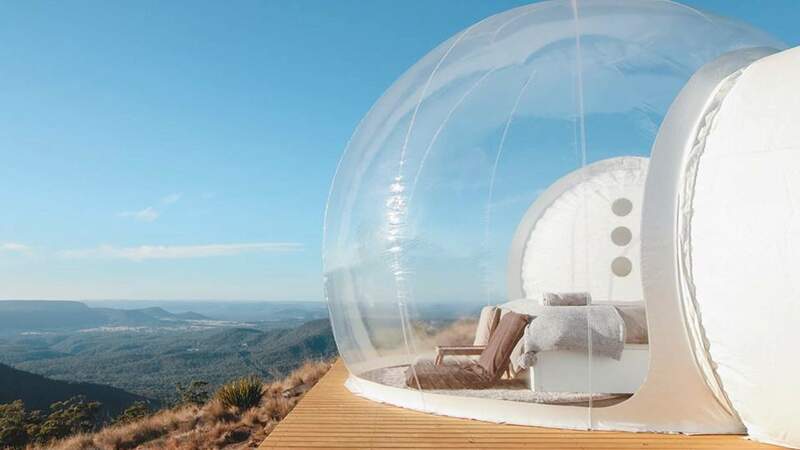 Overlooking the Capertee Valley, this hi-tech bubble tent has a zero carbon footprint. But while it's off-grid, it certainly doesn't skimp on comfort, boasting a plush queen-sized bed, cooking facilities and a separate bathroom area complete with compost toilet and a sink with pump water. There's even a telescope for late-night stargazing sessions from the comfort of your bed. 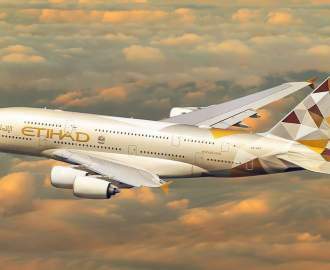 Getting a booking might be tricky though — so good luck. 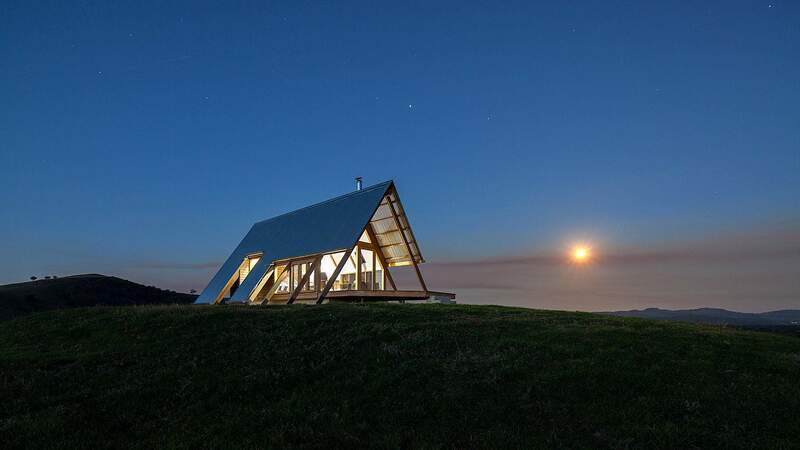 This architecturally impressive A-frame hut sits proudly atop a hill boasting 360-degree views of the surrounding Kimo Estate, a 7000-acre working farm near Gundagai. Here, you can soak up morning mist, wandering sheep, the meandering Murrumbidgee River and distant mountain ranges, all without getting out of bed. The hut itself offers modern looks and luxe furnishings, and is entirely off-grid, featuring a solar-powered shower, a fire and a barbecue. Pull up a seat on the sun-drenched front deck and you'll feel both at one with nature and on top of the world. Set amongst the rolling hills of Mudgee, about 260 kilometres northwest of Sydney, the idyllic Sierra Escape will find you getting back to nature in style, offering a luxury glamping experience to take your breath away. The property's opulent off-grid tent set-up features a comfy king-sized bed, a crackling wood fireplace, a camp stove and fridge, and floor-to-ceiling windows making the most of those sweeping views. Throw in a freestanding bath, rain water shower and a proper flushing toilet, and you might just forget why you ever lived in the city in the first place.